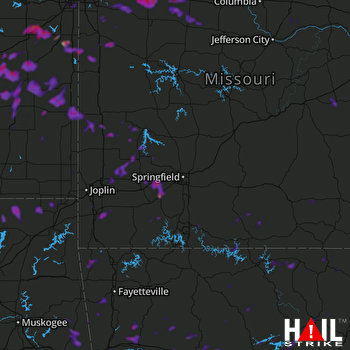 Doppler radar detected Quarter size hail near Neosho, MO, Clarksville, AR and Paola, KS on August 17, 2018. This hail storm was traveling ESE at 28 mph and the entire storm produced hail for roughly 3 hour(s). There were 6 spotter report(s) with reported max hail size of 1.25″ and an average hail size of 1.06″. We estimate that 83,747 buildings were in the affected area and the probability of hail DHI detected was significant. Based on this information, you can expect to see minor damage to vehicles, tile roofs and crops in isolated areas (Intensity Rating 2). 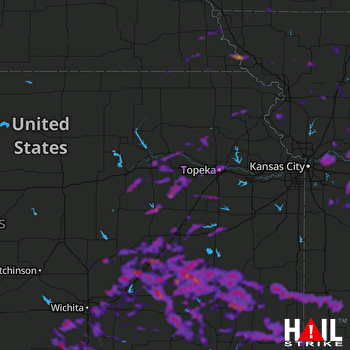 Doppler radar detected Half Dollar size hail near Emporia, KS, Paola, KS and Fort Scott, KS on August 17, 2018. This hail storm was traveling E at 18 mph and the entire storm produced hail for roughly 6 hour(s). There were 11 spotter report(s) with reported max hail size of 2″ and an average hail size of 1.3″. We estimate that 79,718 buildings were in the affected area and the probability of hail DHI detected was significant. Based on this information, you can expect to find damaged crops, glass damage, automobile bodywork damage, as well as isolated roof damage (Intensity Rating 3). 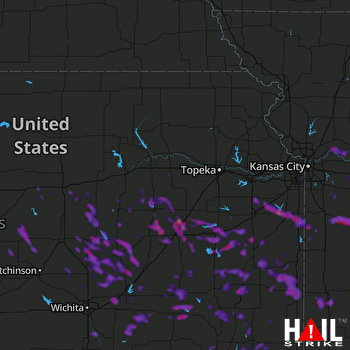 Doppler radar detected Half Dollar size hail near Topeka, KS, Independence, MO and Manhattan, KS on May 15, 2018. This hail storm was traveling E at 7 mph and the entire storm produced hail for roughly 8 hour(s). There were 40 spotter report(s) with reported max hail size of 2.5″ and an average hail size of 1.25″. We estimate that 87,596 buildings were in the affected area and the probability of hail DHI detected was significant. Based on this information, you can expect to find widespread roof damage, broken glass and automobile bodywork damage in well populated areas. 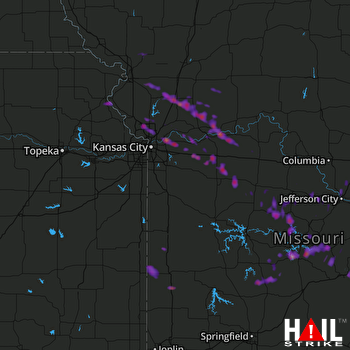 Doppler radar detected Golf Ball size hail near Kansas City, MO, Liberty, MO and Carrollton, MO on October 14, 2017. This hail storm was traveling ENE at 43 mph and the entire storm produced hail for roughly 1 hour(s). There were 2 spotter report(s) with reported max hail size of 1.75″ and an average hail size of 1.75″. We estimate that 43,573 buildings were in the affected area and the probability of hail DHI detected was significant. Based on this information, you can expect to see minor damage to vehicles, tile roofs and crops in isolated areas (Impact Rating 2).